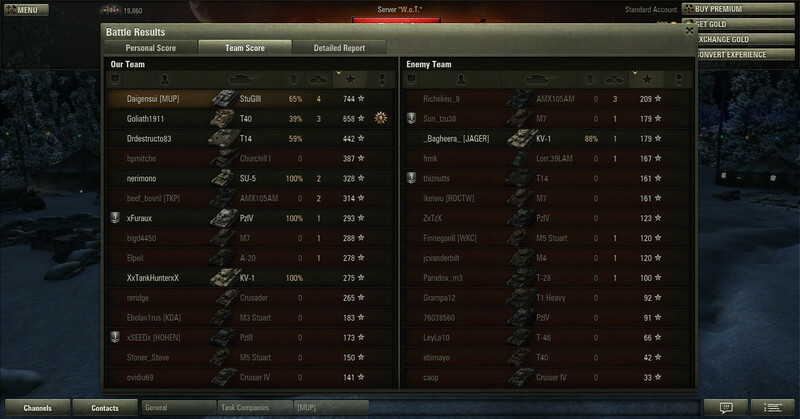 Well, the fact that the KV-3 is low and the IS is only a little more higher I can pen them easily from the front. But if your tank is too high, then aim for the commander's copula, is a bit HIT ME written all over the top of the tank. Type 59 weakspot guide. Yes, the copula is a weak spot, but keep in mind a good Type 59 player will be twisting between his shots. So other than those two tiny spots at the top and some small areas close to it's gun, it's turret is nearly invincible to most regular guns.. Especially at harder angles.. I earned Lehväslaiho's Medal tonight, in a game where I got kill credit for two Tigers in my T-34. Earlier in the evening I destroyed a Tiger with the Easy Eight. It's a bit alarming to me, since I am continuing to not really enjoy my Tiger, that I've become fairly good at outfighting them in close quarters. Though I did have a decent time in Prohorovka with my Tiger when there was no arty and I was able to sit unnoticed on the northeast hill for a while. I never feared the Type 59 ever since I reach my tier 8 Centurion, the 20pdr have no trouble pen it in the front and the 105mm L7A1 on tier 9 Centurion could pen those Type 59 anywhere. 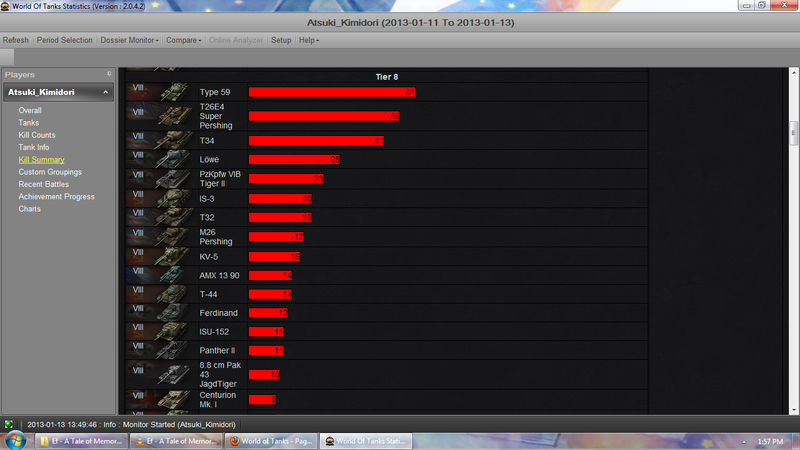 just look at which tier 8 I killed the most. Well, the type 59 compared with the thing is today with how it was back on where it was released it had the very same armor that the T-54, and it was almost imposible to kill, even for tier 9 tanks. Besides it had an almost ungodly acceleration and damage. Take particular notice of the small section marked A3, which is the driver's viewport. If you're forced into a facehug with a Type, this is what you do; push back, switch to sniper mode, and put all your rounds into that viewport until either it or you dies. 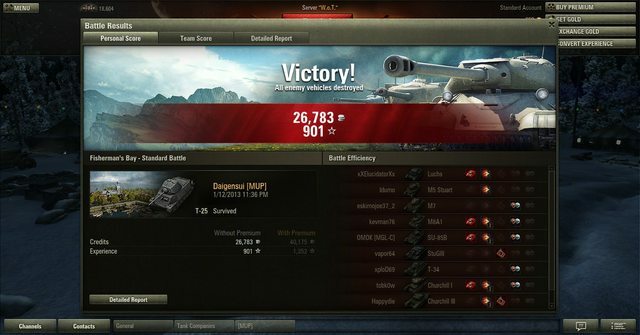 This works for its Tier IX predecessor, the T-54 as well; I was running my Type today, and a T-54 got me into a facehug. Apparently the guy didn't know what he was doing, as shooting his driver's viewport was how a Tier VIII premium like myself beat a Tier IX like his, one-on-one. It's always fun to hit weakpoints and watch higher tier tanks squirm with confusions. Not having a good idea of where weakpoints are generally located on tanks is a fantastic way to go down in a blaze of glory. Viewports and machineguns are generally weakpoint, as well as hatches and any doodads or knick-knacks that are added to the tank. Because, you know, mounted lights or bits of metal sticking out are totally vital to the structural integrity of your tank. The guide to weak points for World of Tanks: Is it an important part of the tank? Does it have a vital purpose? -> No -> Shoot it. ; Did it penetrate? -> Of course it did. Had a fun run-in with an IS-3 today. We weren't but feet away from eachother, him half behind a building at a nice angle and me in a small crater somewhat straight-on in my Black Prince. Where it got hilarious is that for some reason shooting the corner of his side and front armor would always yield penetration for a good 5-6 shots in a row. All of his shots bounced. It's hard to aim when you're laughing maniacally! They sometimes patch out weakspots though for better or worse depending on the tank. For example, the rangefinder "ears" on the side of the T29's top turret used to be a significant weak spot, but now hitting them no longer does HP damage. It's why keeping on top of where a tank's weakspots are is essential, just so you don't waste rounds on bouncing shells. They're not? Hm... It's a good thing I always avoided shooting at them because I knew I would miss. I could swear I've gotten a bit of HP damage on those stupid things recently though. I know that the gussied up Pershing with the added armor and the dual cylinders on the top of the turret, those dual cylinders worked for me quite nicely. Why shooting a couple of strange cylinders oddly placed on the turret of a tank can cause it to explode and award me money and arbitrary points is lost to me, however. First, you're talking about the T29E4 Super Pershing and not the M26 Pershing. Secondly, it's not the cylinders (they're called equilibrator springs, used to balance the heavy 90mm gun) that are actually getting damaged, and in fact they're not part of the tank's Hit box. Rather, it's the part of the turret behind it that's taking damage. The top of the turret unprotected by the spaced armor is undoubtedly one of the easiest weakspots of the Super Pershing to hit. It's why the Super Pershing despite its formidable armor still works best in hull-down like any other US tank: when hull-down on a slope, only the spaced armor + mantle is shown to the enemy, preventing them from targetting your vulnerable turret top. Wait what? I swear I've been doing constant damage on fellow T29 by shooting on the ear with my 90mm gun. Was that recently? Cause my M103's M58 gun doesn't seem to do damage when I shoot at a T29's ears, and when I asked about it it seems the rangefinder weakness was fixed. Might depend on which direct the ears are shot from though. Well sold my M4 for an ELC AMX, first game went really well got three kills with my stock gun ( ) including a Tier 6 tank (D.Max) but after that it went poorly. So I started following the advice by RRW by not doing anything in the beginning or I like to push heavy/slow tanks to the front (not sure how effective pushing tanks is) and the games are going a lot better that way. My favourite tactic so far is hugging tanks thanks to the horrible gun depression on most tanks (with the exception of US tanks of course) you can get away with it. When they are not killing me, they knocked most of my crews instead. I just hate arty more and more. I was shooting them straight off from the front, though. 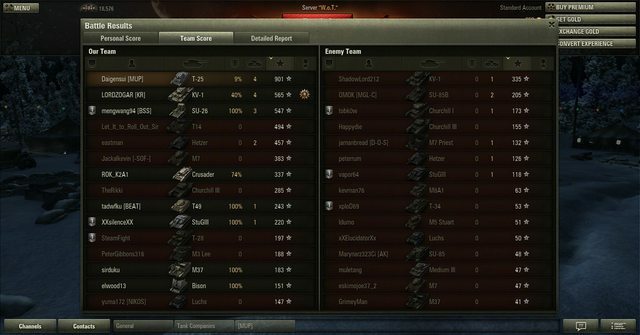 In my E50, I do not fear T10s. 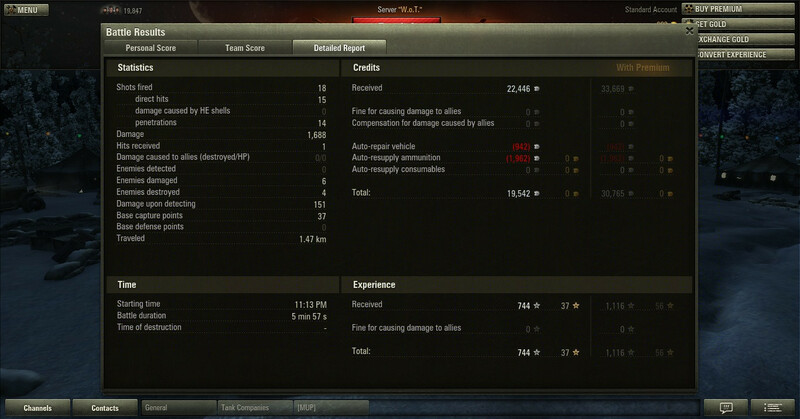 I fear the arty that gets put into t10 matches.